We are now in The Age of Novus Capitis. Novus (New) Capitis (Capital). In this new age of Novus Capitis, Artificial Intelligence (AI) is being used to turn our children’s minds into a new form of capital, via predictive analytics technology. Predictive analytics uses mined education data to create software programs that have the ability to predict and modify the behaviors of ALL students. Students; the next generation, are now seen as an investment vehicle, a product, to be managed via Total Quality Management (TQM) for a globally controlled workforce, in a globally controlled economy. Previously, in America, your past did not determine your future. In America, we have a history of great prosperity and innovation, because, in America, we have valued an education of opportunity (Equal Opportunity), based on an individual’s freedom and their ability to achieve great things. When an individual has a solid foundation in reading, writing, math, and history, as an adult that individual is free to succeed, and, free to fail, and then learn from that failure, and still go on to do great things. In the Age of Novus Capitis, every American citizen will be tracked, sorted and trained to be a global citizen, who happens to live in America. When we send our children into schools across America; all schools, public, private and charter; are they getting what they need academically? 1. If our children are badged and credential by 17 or 18, in this Novus Capitis system, but have attitudes, values, beliefs, behaviors and a worldview that we oppose and we know it is because the computer programs used to train them, have trained them to question and even oppose the traditional, foundational beliefs of our family, our country and our religious beliefs; is that really a solid academic education that will serve our children and their future well? 2. Is having our children exposed and immersed in other languages and cultures more important than passing on America’s history of liberty and freedom of the individual? 3. Now that your children’s education has shifted to a “learn to earn” workforce model, where they can get a paying job, but no longer respect, much less believe, they are worthy of a free and prosperous country, a strong marriage and that by the grace of God anything is possible; have we done our best to give our children a strong foundation for a happy, joy-filled life? 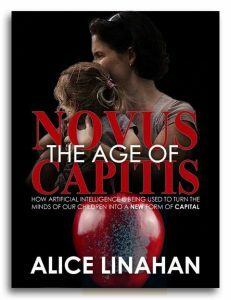 An interactive 6-week study of “Novus Capitis”, led by Alice Linahan, that will take participants on a journey of understanding the world we are now living in. This study can be done as an individual or taken by a local community group. A toolbox for participants to leave with allowing them to protect their loved ones and themselves locally, in The Age of Novus Capitis. Donate to WomenOnTheWall.org here – We are raising money for the production costs of this project. For every $50 donated, the Work-study materials and program will be sent, when published. The goal of the communication team: Become the experts in the local area for education news and information. This entry was posted in Blog by Alice. Bookmark the permalink.